Cooper Tire has announced the addition of the Roadmaster RM351 HD tire to its commercial tire lineup. 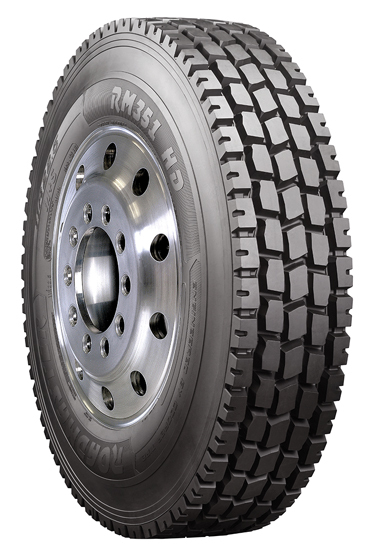 Engineered for mixed-service applications – such as on a mixer or dump truck – the tire is designed for both on- and off-road driving, and comes in 2 sizes: 11R22.5 and 11R24.5, in load range H.
The Roadmaster RM351 HD is a full inch wider than its predecessor, the RM300 HH, with a 20% larger footprint. Coupled with its deep 32/32” tread depth, it provides up to 25% more distance to removal – depending upon the application. To help ensure long tire life, tie bars between the outside lug and the shoulder, along with shoulder grooves that are linked and interlocked, help ward off tire squirm and irregular wear. The sidewall is extra thick with a curb bar protector to help protect the casing from cuts and scrubbing. For traction and long-life performance, the tire features 5 lugs that have an open pattern to minimize stone holding while enhancing traction. Stone ejector ledges, coupled with angled grooves, also help prevent stone drilling. “That’s a key feature of the tire as it will be used off-road where sharp stones can be a tire’s worst enemy if they’re allowed to drill into the casing. The way we designed this tire helps preserve the casing for multiple retreads,” added Mr. Schroeder. The Roadmaster RM351 HD’s casing itself is extremely robust, with 4-belt steel design construction. Cooper provides a 6 year, 2-retread warranty on the RM351 HD. “The casing we’ve developed for this tire, along with the warranty, provide life and cost efficiency beyond the original tread,” said Gary Schroeder.